The Mitchell MS400 electric guitar features a thin profile, single cutaway, mahogany body and an easy-playing shallow-C mahogany set neck design. A unique heel joint provides supreme playing comfort and upper fret access. 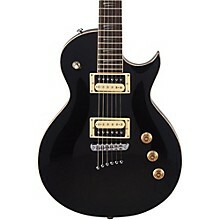 Includes dual humbucking paraffin-dipped alnico V pickups that reduce microphonics and unwanted feedback. Separate volume controls for each pickup let you blend as needed, while a pull coil-tap allows you to split both humbucking pickups into a single-coils. The flame maple binding and purfling further enhance the high-end look. High-ratio locking tuners provide precise tuning, while the jumbo frets and string-thru body design offer increased sustain and bite. Before delivery to dealers, all Mitchell electric guitars receive a complete stateside setup and quality control inspection to ensure exceptional playability. 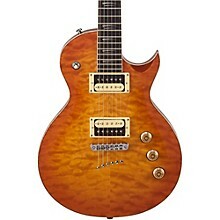 Available in Black (BK), or Honeyburst with AAA quilt maple veneer top (QHB). Case sold separately.